Controlling Time introduces Edgar Treeves. Treeves is a modern master of human behavioral science in the tradition of Sherlock Holmes, the master of deductive reasoning. Anyone can predict what a policeman will do if a stranger slaps him. Edgar Treeves can predict what anyone will do seconds before they do it. His “Watson” is the deadly unarmed assassin known only as Time. They are a top-secret team tasked with infiltrating and preventing imminent, devastating activities conceived to destroy the lives of countless innocent victims. They are not friends. They are destined to become mortal enemies on the day that Treeves is forced to employ his weapon, Time, in a manner even the brutal killer cannot accept. As we learn more about the dynamic between Time and Treeves, Controlling Time also tells the story of Michael Case, a resident of the San Francisco Bay Area. Case has obtained enormous wealth through an accidental friendship with Aram Cooper, the foremost technological genius of his generation. Cooper is on the verge of transforming his creation, SAM, from the most “intelligent” computer on earth to a computer with a mind of its own. When Case’s mysterious fiancé, Callie, is taken from him, he must rely on all of his friends, including Cooper and the brilliant Haitian Chef, Jackson Aurelian, to uncover Callie's dark secrets before it's too late. 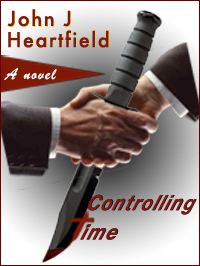 Controlling Time is a thrilling adventure and a rich character study. It grabs and holds the reader's attention from the first page as it reveals the ties that bind together the men and women who must, in some way, control time. JOHN J HEARTFIELD’S WEBSITE IS ALWAYS GROWING. Copyright © 2008-2019 eCurtain Media LLC. All Rights Reserved. Designed, Built & Programmed By: John J Heartfield of eCurtain Media LLC. without the express written consent of John Joseph Heartfield.